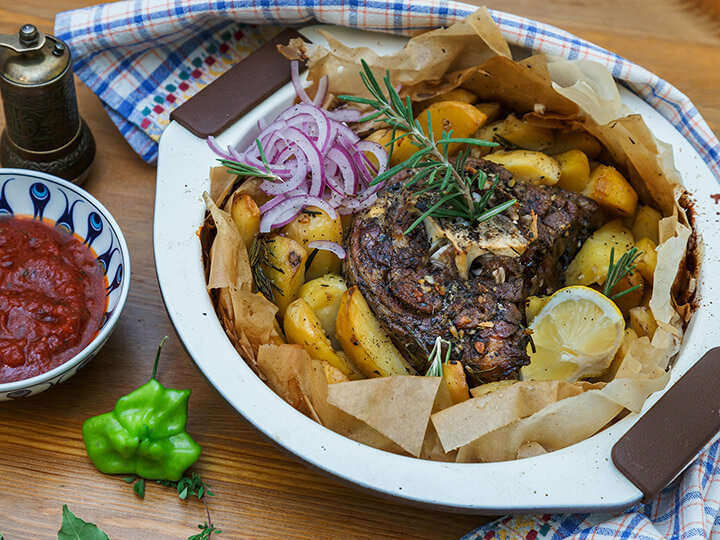 Kleftiko is a tender and hearty lamb dish that is a standard part of traditional Greek cuisine. Flavor is infused through a long and slow marinade that usually includes garlic, cinnamon, and lemons. While the most traditional Kleftiko is prepared using a bone-in leg of lamb, there are many different styles of preparing the meat that have long and gentle cooking in common. Legend has it that lamb Kleftiko, meaning stolen lamb or lamb in the style of the klephts, originated in the thievery of bandits known as the klephts. Since the klephts were wanderers and did not own flocks of their own, they would steal sheep and cook them in a sealed pit to trap smoke and to keep their meal hidden. Today, kleftiko is a dish enjoyed across Greece. One of the more popular variations is to wrap the lamb and marinade in a parchment packet to seal in flavor during the roast. The method below uses the convenience of a slow cooker to capture the traditional kleftiko tenderness and flavor. Its short hands-on preparation time makes it ideal for a hot meal for a family to enjoy together at the end of a busy day. 1. Create a mixture using the olive oil, lemon juice and zest, oregano, rosemary, cinnamon, garlic, salt, and black pepper. Rub the mixture into the leg of lamb and allow to rest covered in the refrigerator overnight. 2. Dice the potatoes and onion and place along with the lamb and the marinade into a large slow cooker. Add the bay leaves and the stock. Cook on low-medium heat for at least 8 hours. 3. Remove bay leaves. Serve with feta or plain yogurt. Back to the Recipes index page.